In a past article, I discussed the democratization of video games and briefly listed a few game development tools that are accessible to non-programmers. In this article, I'd like to go into further detail about the two tools I've used, RPG Maker and Twine, and offer examples of games made with them. 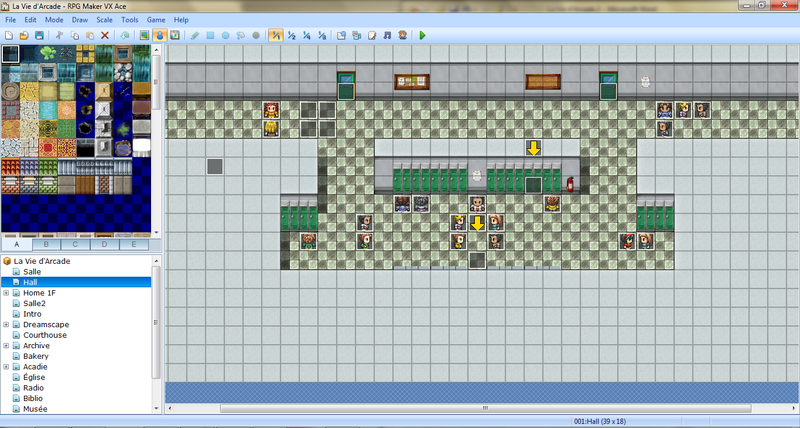 About four years ago, a friend of mine introduced me to RPG Maker VX. If he hadn't, my life wouldn't be the same, for real. It's the tool that got me started on game design. RPG Maker is a group of software programs that allow the creation of 2D Japanese-style role-playing games. 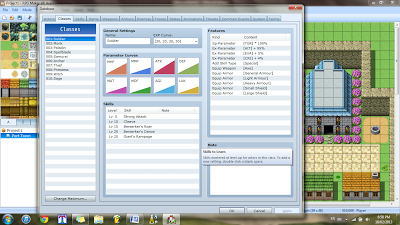 Although RPG Maker games may seem dated and simple, the editor allows for in-depth design and complex operations while remaining very user-friendly. During university, I spent countless hours on an RPG Maker project. It started out as a joke and turned into a 10-hour game. Over-ambitious and unbalanced, the project was doomed, but I learned a lot during its development and it was a lot of fun. 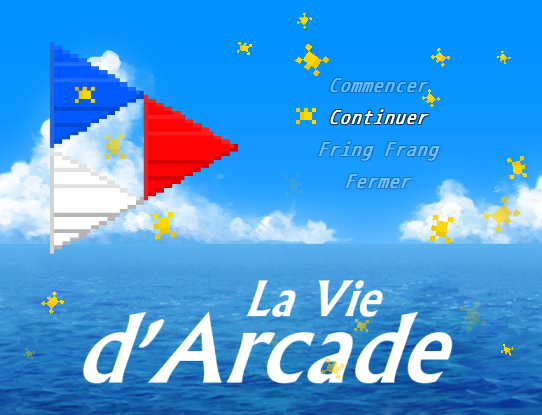 My current project is an RPG Maker game called La Vie d'Arcade. It's about Acadian culture and how that makes us different from the majority. Learn more about it here! Who else is making RPG Maker games? Mostly hobbyists like me. Some of my friends have RPG Maker side projects too. This year, I've heard tell of two people making an RPG called Under Birth. There are multiple lists of traditional-style RPG Maker games. PC Gamer also made a list of their top 5 RPG Maker games. James from Extra Credits even recommended an RPG Maker game. Moncton rockers The Motorleague have released Atlantic Canada: The RPG. One of their music videos even serves as a sort of trailer for the game! Check it out below. Here are some other notable RPG Maker games: Unemployment Quest raised ten times its Kickstarter goal. Actual Sunlight is a game about depression set in Toronto. Jon Heder from Napoleon Dynamite is co-creating a horror film and its accompanying RPG Maker video game. Kanye Quest exists. 4chan is making a surprisingly awesome-looking Pokémon game. Check out the wiki and the demo. There are some great designs! Icetope and Chillnobyl are my favorites. 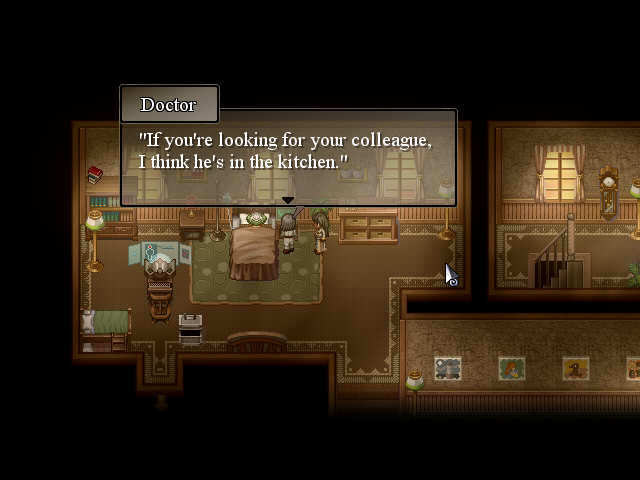 The best RPG Maker game I've played is by far Freebird Games’ To The Moon. To the best of my knowledge, it’s the most popular RPG Maker game out there. This Canadian game has built a cult following and has earned great reviews. A follow-up called A Bird’s Story is in the works. It's the game that inspired my first ever blog post. 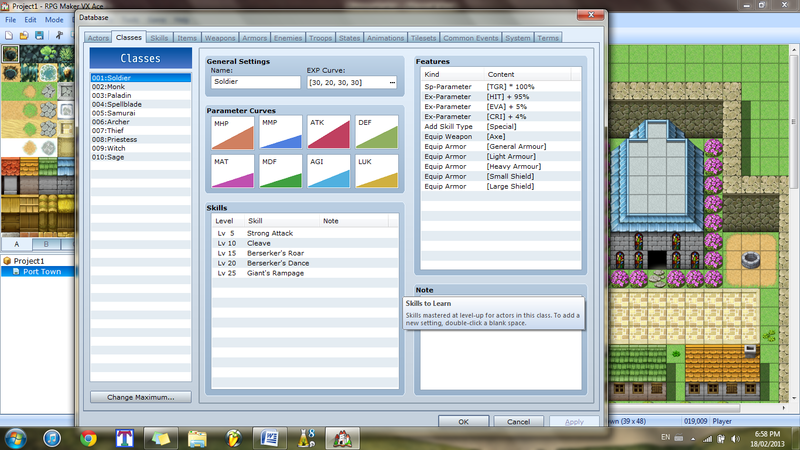 It also goes to show that you can make more than RPGs with RPG Maker. The Columbine RPG was, unsurprisingly, controversial and highly criticized. Click here to read Polygon’s recent detailed article from which I pulled the above quote. It's an interesting read! It's crazy that an amateur game one guy made was such a huge deal at the time. I've recently started using Twine, a free and easy-to-use program that lets you create interactive stories. 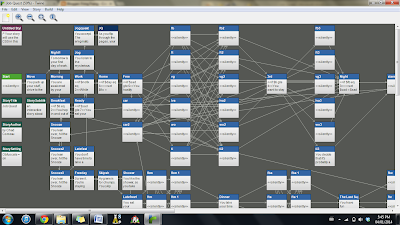 From what I gather, there are many tools that allow the creation of interactive fiction, but Twine is the most accessible for non-programmers. A growing collection of Twine games can be found online (here, here, here, or here for example). Interactive fiction is at the intersection of literature and games. I'm very curious as to how narratives are changed by interactivity and how this changes storytelling. If you're a writer and are curious too, I'd love to explore this space with you. Click here for more details. Earlier this month, I finished my first Twine game. 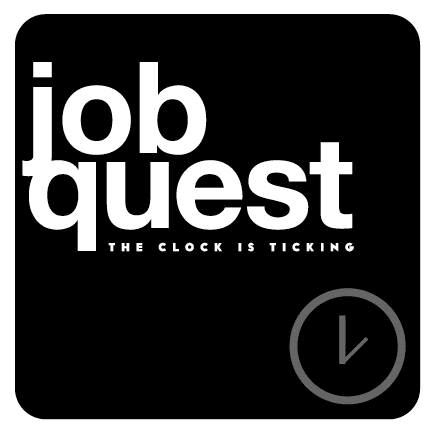 Click here to play Job Quest! Twine games are published as web sites, so anyone with internet access should be able to play. 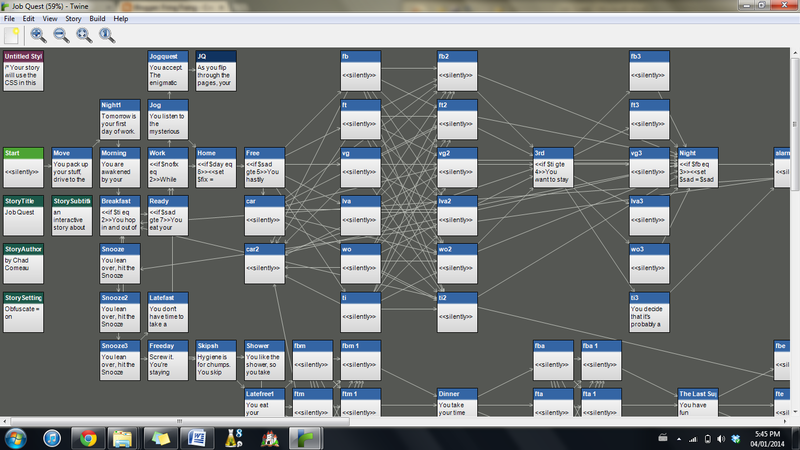 Twine file for Job Quest. You can see the connections between passages. As for recommendations of Twine games, I haven't played that many yet, but here are a few that I liked: Depression Quest is the first Twine game to pass Steam Greenlight. It's a great example of a video game using its interactivity and representational power to help people better understand mental health. It explores similar themes to my game (and coincidentally has a similar name format), but I can't say it served as an inspiration since I only played it after completing Job Quest. And the Robot Horse You Rode in On by Anna Anthropy is a fun and interesting story that makes good use of choice in its narrative. In her book Rise of the Videogame Zinesters, Anna calls for more minority representation in video games, an artistic space dominated for long by straight white programmer dudes. And she's not just all talk: her games definitely show us examples of what she means. Play her games and see for yourself! Emily Short's games are supposed to be really good. They're next on my to-play list. There is a surprising amount of interactive fiction out there, so check out one of the above links and start digging! There’s a large variety of games, so I'm sure everyone can find a Twine they like. Conclusion: Games are easier than ever to make, and a wide variety of games are being made. Everybody wins!